A 32-year-old Nicaraguan man died early Tuesday morning in Victorville, six days after attempting suicide at an immigration detention facility in the high desert. Personnel conducting routine evening rounds found Osmar Epifanio Gonzalez-Gadba hanging in his cell at the Adelanto Detention Facility on March 22. Medical staff at Adelanto called 911 and began efforts to resuscitate him, according to an ICE statement. Gonzalez-Gadba was transferred to the intensive care unit at Victor Valley Global Medical Center in Victorville, where he was placed on life support. He never regained consciousness. The preliminary cause of death is thought to be heart failure caused by the cerebral edema which resulted from asphyxiation, according to ICE. 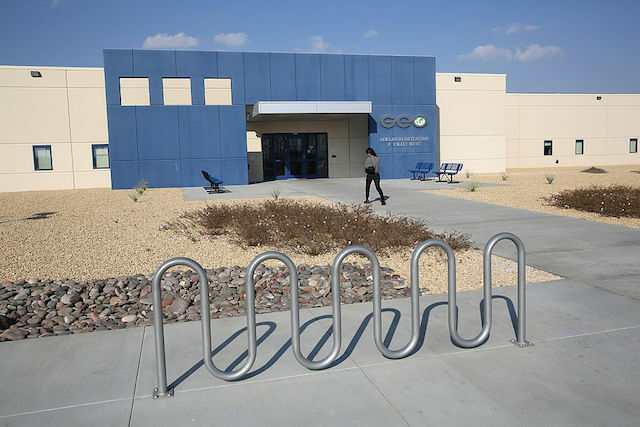 The privately-owned Adelanto Detention Facility is run, like many other immigrant detention facilities, by GEO Group, the nation&apos;s second largest for-profit prison operator. ICE contracts with the city of Adelanto for the space, and the city of Adelanto contracts with Geo Group to run it, according to KPCC. Adelanto is the largest immigrant detention center in California, with a population approaching 2000 people. Gonzalez-Gadba did not have a criminal history, according to ICE spokeswoman Virginia Kice. He had been previously deported to Nicaragua in April 2016. Kice reports that his most recent arrest was made by U.S. Border Patrol in the San Diego area. Gonzalez-Gadba was transferred to ICE custody on December 29, 2016, following his arrest. A representative from the Nicaraguan consulate told LAist that they did not yet have enough information to comment on the situation. "At the time of his death, we were endeavoring to try and get a travel document to repatriate him to Nicaragua," Kice told LAist. It does not appear that Gonzalez-Gadba had been living in the U.S. prior to his December 2016 arrest. "As far as I know, he was encountered near the border, arrested by the Border Patrol, and transferred to our custody," Kice said. Gonzalez-Gadba is the second immigrant detainee to die in ICE custody since President Trump took office on January 20. Roger Rayson, a 47-year-old Jamaican immigrant, died on March 13 in New Orleans of apparent cardiac arrest. Rayson had Burkitt Lymphoma, "a fast-growing lymphoma that is curable by treatment," according to ThinkProgress.